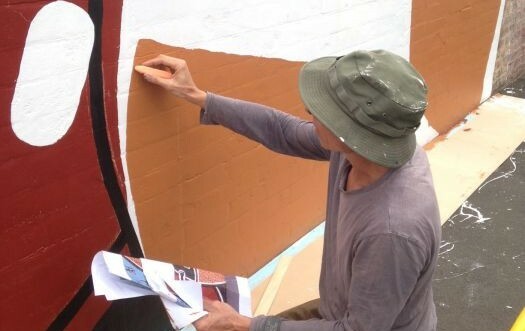 REDFERN: The 40,000 Years mural at Redfern station is finally being restored after a long campaign by the Redfern Station Community Group (RSCG) and many other local activists. From Wednesday March 14, pedestrians have noticed work taking place under the supervision of architect Peter Lonergan and lead painter Richard Lucas. The wall will be entirely stripped back and the mural repainted based on photos of the original finished work from 1983. The restoration is expected to take between six and eight weeks. The RSCG only found out a week before work began that the project had been approved, but an official launch on Tuesday March 13 was well attended, according to Aunty Donna Ingram, who organised the event at short notice. “The fact that we pulled it together quickly and all the partners took time out of their busy days to attend … that just shows to me that they see the importance of it, like we do as a community.” The launch featured a celebratory cake decorated with motifs from the mural. Advising on the restoration are original mural artists Carol Ruff and Noonuccal woman Avril Quaill. “It’s really exciting and heartening to hear that the mural will be restored,” Ms Quaill said. She described how working on 40,000 Years was the start of distinguished careers for several artists; including Ms Ruff, a filmmaker; Aboriginal artist Tracey Moffatt, who represented Australia at the Venice Biennale; and Aboriginal songwriter Joe Geia. “I’m now directing my own people’s festival, the Quandamooka Festival, and I did not think I would be doing this all those years ago when I was just a mural assistant. Me working with those people on that mural gave me the incentive to go on and apply for an arts degree,” Ms Quaill said. Assisting with the painting are Aboriginal art students from Eora College Sydney TAFE and artists associated with the Boomalli Aboriginal Artists Cooperative. Instagram users can keep track of the restoration’s progress by following @40000Years. Peter Lonergan’s previous experience includes designing the Australian Aboriginal art exhibition at the Musée du Quai Branly in Paris. Richard Lucas previously worked on the Roy Kennedy mural at the Wyanga building. 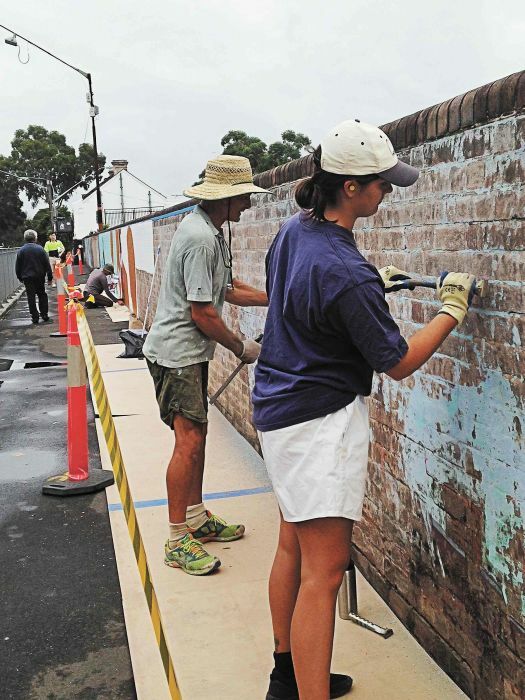 Celebration Day for the restoration of the 40,000 Years Mural will be held Saturday April 28, 11am-3pm, at Redfern Community Centre.